World War II cost America 1 million casualties and over 300,000 deaths. In both domestic and foreign affairs, its consequences were far-reaching. It had an immediate impact on the economy by ending Depression-era unemployment. The war accelerated corporate mergers and the trend toward large-scale agriculture. 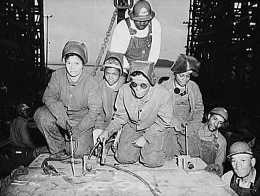 Labor unions also grew during the war as the government adopted pro-union policies, continuing the New Deal's sympathetic treatment of organized labor. Presidential power expanded enormously during World War II, anticipating the rise of what postwar critics termed the "imperial presidency." The Democrats reaped a political windfall from the war. Roosevelt rode the wartime emergency to unprecedented third and fourth terms. For most Americans, the war had a disruptive influence--separating families, overcrowding housing, and creating a shortage of consumer goods. The war accelerated the movement from the countryside to the cities. It also challenged gender and racial roles, opening new opportunities for women and many minority groups. The Allies prevailed in World War II because of the United States' astounding productive capacity. During the Depression year of 1937, Americans produced 4.8 million cars, while the Germans produced 331,000 and the Japanese 26,000. By 1945, the United States was turning out 88,410 tanks to Germany's 44,857; the U.S. manufactured 299,293 aircraft to Japan's 69,910. The American ratio of toilet paper was 22.5 sheets per man per day, compared with the British ration of 3 sheets. In Germany, civilian consumption fell by 20 percent; in Japan by 26 percent; in Britain by 12 percent. But in the United States, personal consumption rose by more than 12 percent. During World War II, the federal government took an even larger economic role than it did during the World War I. To gain the support of business leaders, the federal government suspended competitive bidding, offered cost-plus contracts, guaranteed low-cost loans for retooling, and paid huge subsidies for plant construction and equipment. Lured by huge profits, the American auto industry made the switch to military production. In 1940, some 6,000 planes rolled off Detroit's assembly lines; production of planes jumped to 47,000 in 1942; and by the end of the war, it exceeded 100,000. To encourage agricultural production, the Roosevelt administration set crop prices at high levels. Cash income for farmers jumped from $2.3 billion in 1940 to $9.5 billion in 1945. Meanwhile, many small farmers, saddled with huge debts from the depression, abandoned their farms for jobs in defense plants or the armed services. Over 5 million farm residents left rural areas during the war. Overall, the war brought unprecedented prosperity to Americans. Per capita income rose from $373 in 1940 to $1,074 in 1945. Workers never had it so good. Rising incomes, however, created shortages of goods and high inflation. Prices soared 18 percent between 1941 and the end of 1942. Apples sold for 10 cents apiece; the price of a watermelon soared to $2.50; and oranges reached an astonishing $1.00 a dozen. Many goods were unavailable regardless of price. To conserve steel, glass, and rubber for war industries, the government halted production of cars in December 1941. A month later, production of vacuum cleaners, refrigerators, radios, sewing machines, and phonographs ceased. Altogether, production of nearly 300 items deemed nonessential to the war effort was banned or curtailed, including coat hangers, beer cans, and toothpaste tubes. Congress responded to surging prices by establishing the Office of Price Administration (OPA) in January 1942, with the power to freeze prices and wages, control rents, and institute rationing of scarce items. The OPA quickly rationed food stuffs. Every month each man, woman, and child in the country received two ration books--one for canned goods and one for meat, fish and dairy products. Meat was limited to 28 ounces per person a week; sugar to 8-12 ounces; and coffee, a pound every five weeks. Rationing was soon extended to tires, gasoline, and shoes. Drivers were allowed a mere 3 gallons a week; pedestrians were limited to two pairs of shoes a year. The OPA extolled the virtues of self-sacrifice, telling people to "use it up, wear it out, make it do, or do without." In addition to rationing, Washington attacked inflation by reducing the public's purchasing power. In 1942, the federal government levied a 5 percent withholding tax on anyone who earned more than $642 a year. The war created 17 million new jobs at the exact moment when 15 million men and women entered the armed services--unemployment virtually disappeared. Union membership jumped from 10.5 million to 14.75 million during the war. During the 1944 presidential campaign, President Roosevelt unveiled plans for a "GI Bill of Rights," promising educational support, medical care, and housing loans for veterans, which Congress approved overwhelmingly in 1944. Unwilling to switch leaders while at war, the public stuck with Roosevelt to see the crisis through. The president easily defeated his Republican opponent, Governor Thomas Dewey of New York, receiving 432 electoral votes to Dewey’s 99 votes.